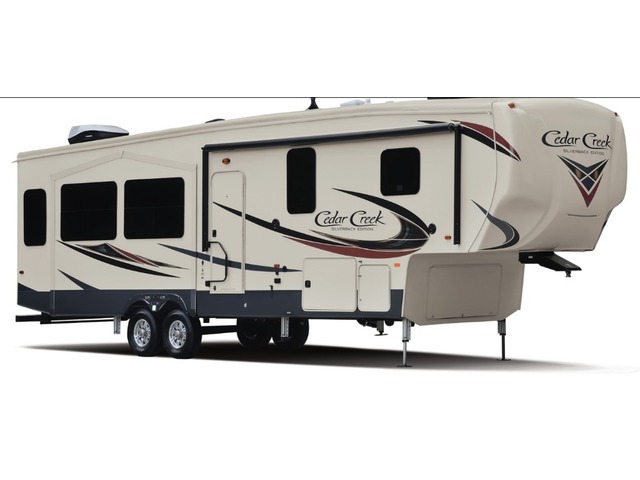 The Smart Choice for the experienced RVer, Silverback by Cedar Creek allows plenty of living space for entertaining friends and family. Plus, you’ll enjoy all the styling and amenities of home! Dry Weight 10,689 lbs Pin Weight 1,965 lbs Overall Length 33' 11"
Dry Weight 10,764 lbs Pin Weight 1,985 lbs Overall Length 33' 11"
Dry Weight 11,223 lbs Pin Weight 2,132 lbs Overall Length 36' 0"
Dry Weight 10,939 lbs Pin Weight 2,067 lbs Overall Length 36' 11"
Dry Weight 13,484 lbs Pin Weight 2,764 lbs Overall Length 41' 1"
Dry Weight 12,679 lbs Pin Weight 2,135 lbs Overall Length 42' 2"
Dry Weight 14,190 lbs Pin Weight 3,176 lbs Overall Length 41' 1"